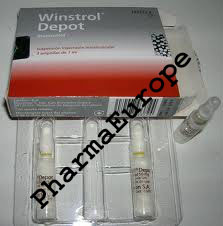 Winstrol is one of the favorite steroids in general, as confirmed by many positive doping cases. Stanozolol, for example, was one of the substances which enabled Ben Johnson to achieve his magic sprints. It also gave this exceptional athlete a distinctly visible gain in hard and defined quality muscles, possibly making quite a few bodybuilders envious. During the first doping-tested professional bodybuilding championships, the Arnold's Classic 1990, the winner, Shawn Ray, and the enormously massive Canadian pro, Nimrod King, tested positive on Winstrol (stanozolol), (FLEX, July 1990). The Track and Field World Champi-onships 1993 in Stuttgart also brought two positive "stanozolol cases" to light. To make a long story short: Winstrol is a very effective steroid when used correctly. It is important to distinguish between the two different forms of administration of stanozolol, since the injectable Winstrol Depot is distinctly more effective than the oral Winstrol. Thus it is preferred by most athletes. What is special about the injectable Winstrol Depot is that its substance is not as is common in almost all steroids-dissolved in oil; it is dissolved in water. Although almost every steroid experienced bodybuilder knows this difference, the practical application of this knowledge rarely occurs: the injection-free intervals of the compound Winstrol Depot must be distinctly shorter than with the other common steroids. Simplified, this means that Winstrol Depot 50 mg/ml must be injected much more frequently than the oil-dissolved steroids (e.g. Primobolan, Deca-Durabolin, Sustanon 250, Parabolan, etc.). The reason for this is the relative low half-life time of steroids. Those dissolved in water must be injected at least every second day, and best results are observed at a daily injection of 50 mg. The substance stanozolol is a precursor to the dihydrotestosterone and consequently, it prevents Winstrol Depot from aromatizing into estrogens with water retention occurring only rarely. Based on these characteristics the main application of Winstrol Depot is clearly defined in bodybuilding: preparation for a competition. Together with a calorie-reduced diet which is rich in protein Winstrol Depot gives the muscles a continuously harder appearance. Winstrol Depot is usually not used as the only steroid during dieting since, based on its low androgenic component, it does not reliably protect the athlete from losing muscle tissue. The missing, pronounced androgenic effect is often balanced by a combined intake with Parabolan. Winstrol Depot, however, is not only especially suited during preparation for a competition but also in a gaining phase. Since it does not cause water retention rapid weight gains with Winstrol Depot are very rare. However, a solid muscle gain and an over proportionally strong strength increase occur, usually remaining after use of the compound is discontinued. Bodybuilders who want to build up strength and mass often combine Winstrol Depot with Dianabol, Anadrol 50, Testosterone, or Deca-Durabolin. With a stack of 100 mg Anadrol 50/day, 50 mg Winstrol Depot/day, and 400 mg Deca-Durabolin/week the user slowly gets into the dosage range of ambitious competing athletes. Older athletes and steroid novices can achieve good progress with either Winstrol Depot/Deca-Durabolin or Winstrol Depot/Primobolan Depot. They use quite a harmless stack which normally does not lead to noticeable side effects. This leaves steroid novices with enough room for the "harder" stuff which they do not yet need in this phase. 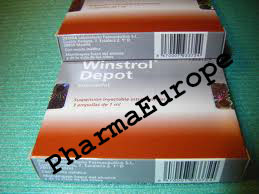 Winstrol Depot is mainly an anabolic steroid with a moderate, androgenic effect which, however, can especially manifest itself in women dosing 50 mg/week and in men dosing higher quantities. Problems in female athletes usually occur when a quantity of 50 mg is injected twice weekly. The effect of Winstrol Depot decreases considerably after a few days and thus an injection at least twice weekly is justified. However, an undesired accumulation of androgens in the female organism can occur, resulting in masculinization symptoms - Some deep female voices certainly originated with the intake of Winstrol Depot. However, a dose of 50 mg Winstrol Depot every second day in ambitious female athletes is the rule rather than the exception. Other non-androgenic side effects can occur in men as well as in women, manifesting themselves in headaches, cramps, changes in the HDL and LDL values, and in rare cases, in high blood pressure. Possible liver damage can be estimated as very low when Winstrol is injected; however, in large doses an elevation in the liver values is possible. Since Winstrol Depot is dissolved in water the injections are usually more uncomfortable or more painful than is the case with oily solutions. Although there are many fakes of the injectable Winstrol, the original "Winny " as it is lovingly called by its users, is easily recognized based on its unusual form of administration. At a first glance the content of the ampule is only a milky, white, watery solution which, however, has distinct characteristics. Original "Winny " is recognized because the substance separates from the watery injection fluid when the ampule is not shaken for some time. When the ampule is left flat in its ampule box or, for example, stands upright on a table, the substance accumulates as a distinctly visible white layer on the lower side of the glass and can only be mixed with the watery fluid if shaken several times or rolled forward and backward. An ampule containing 1 ml of suspension and its 50 mg dissolved stanozolol should normally separate a white layer in the size of almost a thumbnail. The athlete thus can easily determine whether his injectable Winstrol is actually stanozolol or is rather under closed. Do not buy ampules or glass vials which contain more than 1 ml of suspension since an original injectable Winstrol is only available in one-milliliter glass ampules. 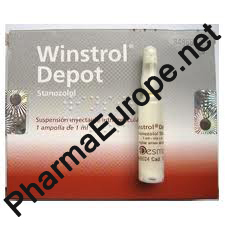 The price for a 50 mg Winstrol Depot ampule lies be-tween $5.00 - 15 on the black market. When injected daily Winstrol Depot can become a very expensive compound. It also has the disadvantage that, because of the frequent injections, the already-mentioned scar tissue will develop in the gluteal region (buttocks) which leads many athletes to inject Winstrol in their shoulders, arms, legs or even calves. Although this was originally intended as an expedient, injecting Winstrol Depot into certain muscles has become increasingly popular since athletes have noticed that this leads to an accelerated growth of the affected muscle. An American pro bodybuilder who is known for his cross striated, horseshoe- shaped triceps owes this in considerable part to his regular "triceps Winstrol-Depot injections." A confusion with the also often used Esiclene is excluded. Athletes who want to avoid daily injections usually take 2-3ml Winstrol Depot twice a week. in the U.S. injectable stanozolol is manufactured only for veterinary medicine. It is distributed under the name Winstrol V by Winthrop and Upjohn.